The Association of Caribbean States (ACS) was represented by the Directorate of Sustainable Tourism and the Directorate of Trade, Transport and External Relations at the EXPO ALADI which was organized by the Latin-American Integration Association (ALADI) and Peru's Exports and Tourism Promotion Board – PROMPERU and was held from October 17-19, 2018, at the Centro de Convenciones “27 de Enero”, in the city of Lima. The Association of Caribbean States participated alongside several Regional Organisations including the Andean Community, Southern Cone Common Market (MERCOSUR, per its Spanish acronym), Secretariat for Central American Economic Integration (SIECA, per its Spanish acronym), and the Food and Agriculture Organization (FAO). The ACS used this opportunity to gather information and engage with the 800 businessmen that participated in the Expo, encouraging them to attend the Business Forum of the Greater Caribbean 2019. 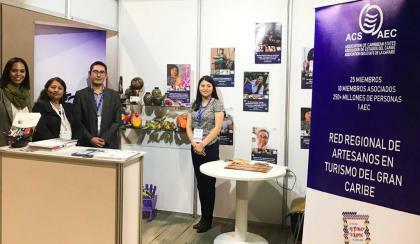 Additionally, the aim of the ACS’ participation was to increase the visibility of the ACS and to raise awareness of the Project "Empowerment of Women Artisan Owners of Micro Small and Medium Enterprises (MSMEs) in the Tourism Sector" which is being implemented with the support of the Republic of Turkey. This project encourages community engagement, poverty reduction and alleviation as well as decent work in the countries of the Greater Caribbean Region. As part of the above-mentioned project, Mrs. Silvia Torrez, a representative of the ACS Regional Network of Artisans in Tourism of the Greater Caribbean was also invited to participate in this Expo to give a first-hand experience of the impact that initiatives such as the aforementioned have in fostering the authenticity and sustainability in the creation of handicrafts, by showcasing some of her products as well as to provide a name and face to the Network. She not only shared information on the activities of the Network but also discussed possible trade opportunities with the Expo participants and explored ways in which the Network can begin trading with other artisans in other countries. To this end, Mrs. Torrez was able to engage contacts with MSMEs of handicraft in Bolivia and the rest of the Region.